Overall, animal health pharmaceuticals (including both companion and farm animals) is a large and dynamic industry globally (valued at $28.6 billion in 2016 alone) with reported annual growth rates of around 5% over the past 10 years. The top pharmaceutical companies in this space are multi-billion dollar operations. Currently, North America and Europe boast the largest global animal health markets, making up 34% and 31% of the total market, respectively. In those geographies, companion animals represent the largest pharmaceutical segments (60% of the market for dog, cat & horse products). The total companion animal pharmaceutical market reached $8.4B in revenue in the US/EU, growing at a rate of 5.4% in 2016. 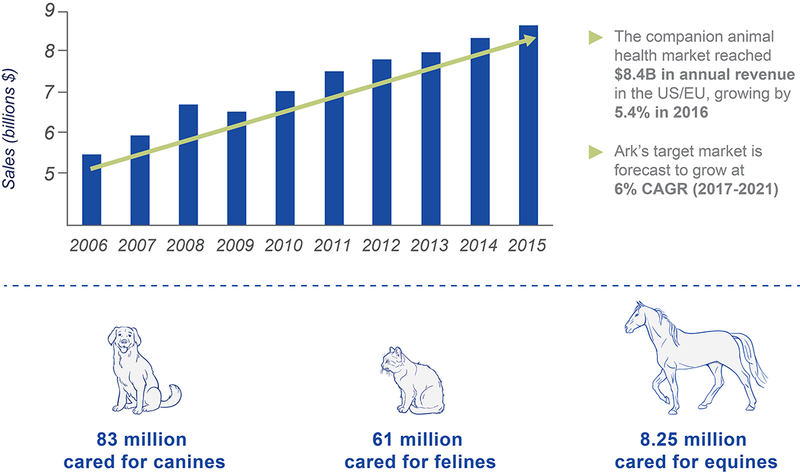 With over 150M “cared for” pets seeing a veterinarian regularly, it is no surprise that this is a flourishing recession-resistant segment of our economy. While most moderate chronic pain can be managed with nutraceuticals, nonsteroidal drugs, or therapeutics, these solutions can become ineffective over time. This ineffectiveness forces veterinarians to prescribe higher and higher doses of opioids and narcotics until owners eventually consider euthanasia as the most humane solution for their beloved pets—an emotionally difficult decision for both the animal’s owner, their veterinarian and the hospital staff. The magnitude of the chronic pain market can be demonstrated by looking at the numbers for severe canine osteoarthritis (OA) treatment. It is estimated that up to 20% of dogs (and some studies state 60% of cats over age 10) have signs of arthritis. 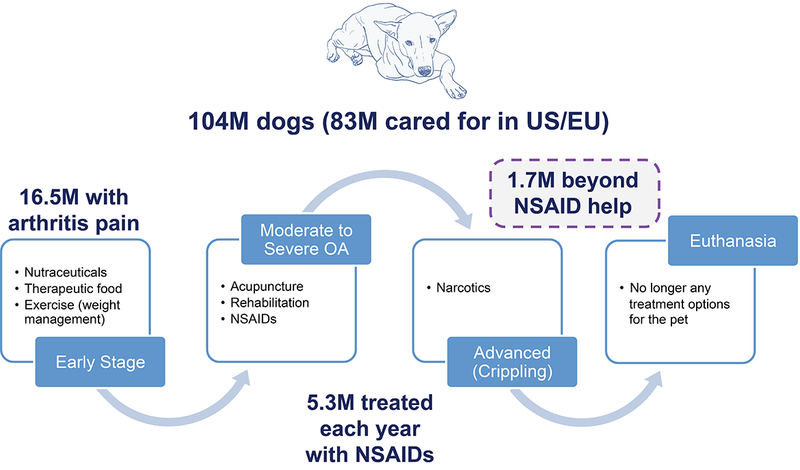 Each year, at least 5.3M canine patients are prescribed NSAIDs for managing chronic OA pain, but because of many factors including convenience and worries about adverse events, the average treatment persistence (number of days the drug is given as prescribed) is only 70 days of treatment per year. At least one-third of those canine patients' therapy is discontinued because of poor response, and every patient eventually reaches an advanced stage where stronger alternatives are needed—up to the point when euthanasia is the only option. According to survey data, veterinarians euthanize, on average, 9 dogs and 6 cats each month (adding to 5.5M dogs and 3.5M cats each year in the US alone). 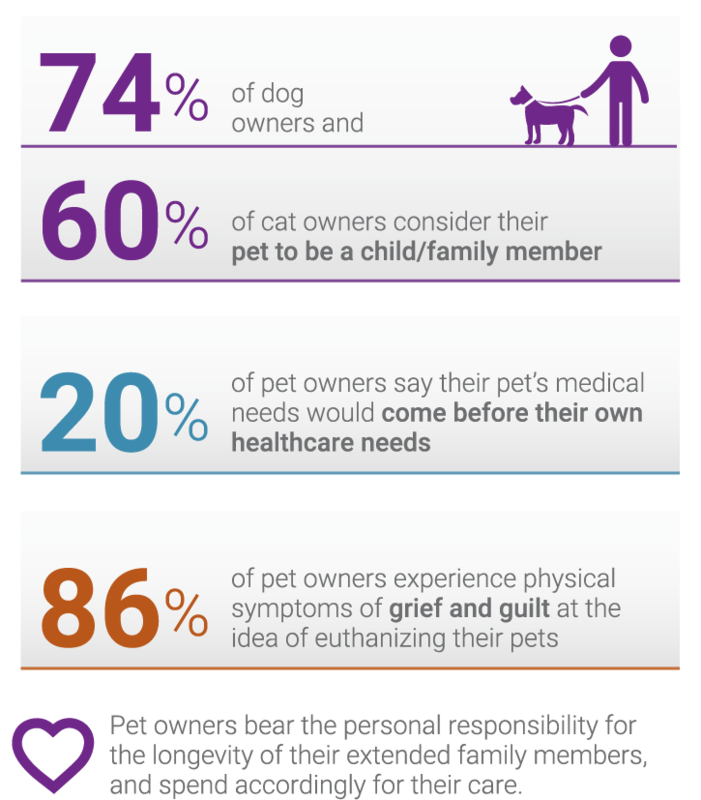 Half of the pets euthanized are for pain and quality-of-life related reasons (mobility, pain, terminal illness). That means that millions of canine patients with severe, difficult-to-manage pain, could, within the next year, become candidates for a completely new type of approach to pain control (such as resiniferatoxin). 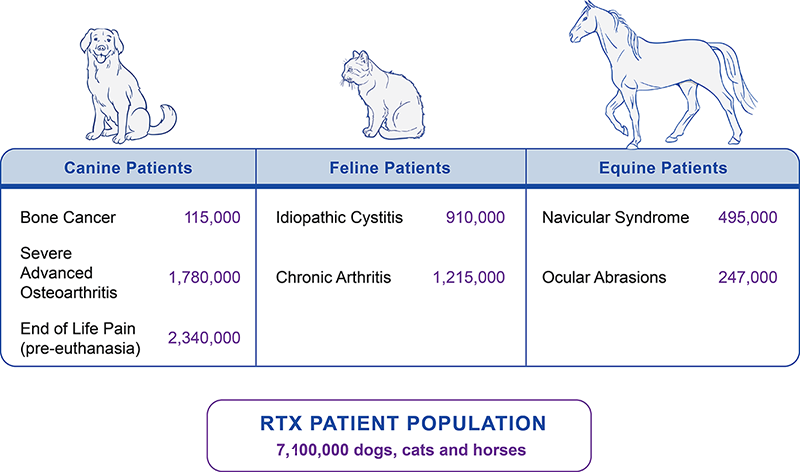 We estimate that resiniferatoxin could effectively address the unmet pain control needs of about 7.1M companion animal patients, across 3 species and 6 core indications for which there are no better alternative solutions today. For any information related to possible investment, joint venture or research collaboration with ARK Animal Health, please contact us directly. To access more confidential investor information, go to our investor data room. If you do not have a login ID or password for the investor data room but would like to obtain one, please contact us directly to verify credentials and obtain a non-disclosure agreement.